My Partner and I are proud to be Social Entrepreneurs. Therefore, every day we talk about Sustainable, Responsible and Impact Investing (SRI). 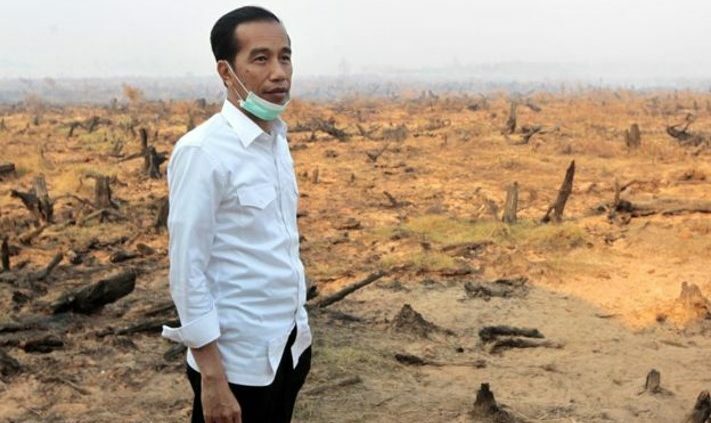 We also talk about Environmental, Social and Governance (ESG) screening and scoring. More importantly, we talk about managing risk, rates of return, portfolio growth and retirement planning. That’s our business! 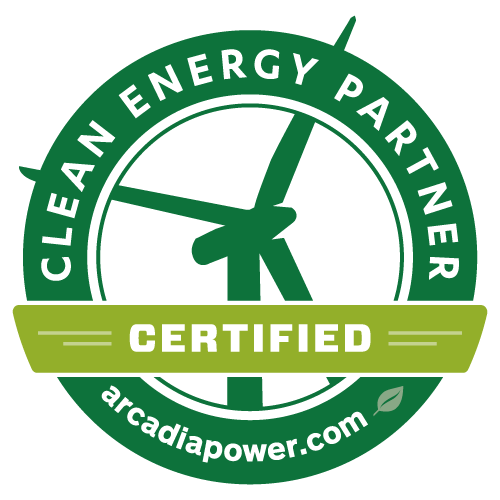 Making money for our clients in a Sustainable and Responsible way. All of these subjects come from the same source – STEWARDSHIP! That’s ultimately the foundation of the discussion. We can ask ourselves: “Will future generations have what they need to live a full and productive life in the future?” The answer is evidenced by each of us, every day. The decisions we make in our daily lives tell our story; good or bad. We will follow this truth: If it is to be it is up to me! Stewardship means mindfully behaving in such a way that if everyone did the same, we would all be better off and our future would be bright! How can we do this stewardship thing? First, we must learn about the Circular Economy where there is NO Waste! Second, we should examine the supply chain management of corporations we buy things from. This will uncover hidden problems or harmful behaviors along the chain. The United Nations gives us a very good road map. They created the Sustainable Development Goals. They speak directly to the subject of Stewardship and show us what needs to be solved! 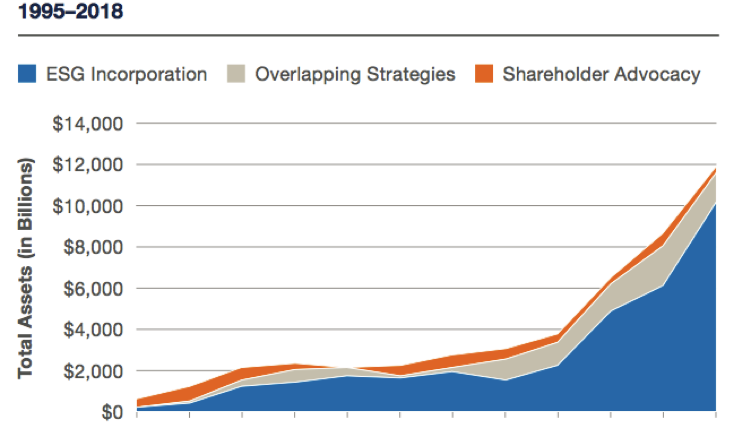 We can also turn to Shareholder Advocacy. This actually FORCES Stewardship when needed! This involves posting resolutions for corporate shareholders to vote on, in terms of continuing or stopping various corporate behaviors. This is the ‘walk softly, but carry a Big Stick’ approach to stewardship. Believe it or not, aberrant corporate behavior can be, and IS, changed every year by shareholder vote, or the threat of a shareholder vote! We can make a difference! There is definitely a need for an overwhelming theme of planetary stewardship. Fortunately it is built into the SRI/ESG world by definition. I think we should actually start taking credit for it! My first step is to start actually using the STEWARDSHIP word aloud in public. 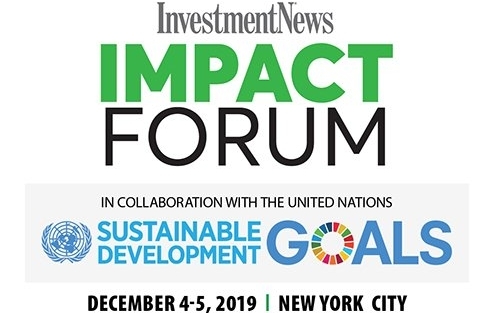 We are excited to announce our collaboration with the United Nations and InvesmentNews to host the first Impact Forum on December 4-5, 2019 in New York City. The vision for this event is huge. On Day One: A film festival will share the stories and stoke the inspiration. The next day, thought-leaders and experts will share strategies and insight for turning inspiration into impact investing action. We hope you will join us! This event started with a film: Impact, a documentary. This film is the model, where we show the impact our investment dollars can have on the world. Now we want to take this global and highlight a story for each of the Sustainable Development Goals. Everyone we’ve shown the first film to has had a personal connection to the stories, and through this project we hope to show how, no matter which goal is most important to you, your investments can make a difference. I’m proud to serve on the advisory board for this event!  We have assembled a team of specialists in Impact Investing to build a world class event, but we need your help. To pull this off, we need a community of ambassadors who want to help the financial advice industry make good investments that also make the world a better place. We are looking for filmmakers, stories, attendees, sponsors, speakers and advocates. Fill out this short form if you would like to be involved with the event. Our partners at ImpactAssets (our high-impact Donor Advised Fund) are also helping us organize film ideas. They’ve created this form to accept submissions. Last year, we gave an interview to a group of students from Rutgers University working on the Aim2Flourish class offered at the Rutgers Business School. As a part of this class, students must select a business working to promote one or more of the United Nations Sustainable Development Goals, and these students chose to write about us. Their article, Investing for a Reason Beyond Money, was selected as a finalist for the 2019 Flourish Prize! We’re in great company! The 76 Finalists for the 2019 Flourish Prizes represent stories from the more than 800 AIM2Flourish.com stories published in 2018, spanning the globe and showcasing business innovations for each of the 17 UN Global Goals. The 2019 Flourish Prizes Finalists include 76 stories from 30 universities in 16 countries under the guidance of 35 professors. The businesses profiled come from 27 countries and more than 19 industries. We’re proud to say we even know a few of them! The prize-winning businesses, professors, universities, and students will be honored during the 2019 Flourish Prizes virtual celebration, taking place online the week of May 6–10. Follow the awards ceremony and see photos and videos from the winners by following #FlourishPrizes2019 on Twitter, Facebook and Instagram. We hope you’ll join us. AIM2Flourish is the world’s first higher-education curriculum, story platform, and prize for the 17 UN Sustainable Development Goals and business’ role in achieving them. The program is an initiative of the Fowler Center for Business as an Agent of World Benefit at the Weatherhead School of Management — Case Western Reserve University. For more information about AIM2Flourish, please contact Claire Sommer, AIM2Flourish Director at Claire@AIM2Flourish.com or +1 917-834-0323. I’m excited to announce a blog post written in collaboration with Gabe Rissman of Stake and the Real Impact Tracker, on the Effective Altruism forum, entitled Effective Impact Investing. A little background, as this links to a fairly obscure corner of the internet: in the distant past, I was a Philosophy major at Rutgers University where I became involved in the philosophy club and founded the Rutgers Undergraduate Philosophy Journal. Through my studies, I became involved with a group called Giving What We Can, which examined both the impact of our charitable dollars (much of which go to administrative overhead at various charities and is otherwise not put to work as donors expect). Bob and I have since been back to Rutgers to speak with this group. While I was studying Philosophy, my partner, Bob Goellner (then my financial advisor) introduced me to Sustainable, Responsible and Impact Investing, and how we can use Environmental, Social and Governance factors in the investment process, and I was struck by how I could align my investments with my values and use the power of money to create change in the world. I became a financial advisor due to my desire to help people plan for their futures and the legacy they leave behind – because future generations depend on the decisions we make today, both in terms of their finances and the impact of our investments on the planet and society. At the end of last year, a philosopher named Hauke Hillebrandt made an argument that Impact investing is only a good idea in specific circumstances (originally titled: “Donating effectively is usually better than Impact Investing”) which I felt compelled to respond to. I’m proud of our response, and very pleased to work with Gabe, as his training at Yale and mine at Rutgers complemented each other nicely. The work we’ve produced together is written in an academic style and references a number of other academic studies as the forum it’s posted in requires, but it represents how we think about impact in our portfolios, and especially how much we value Shareholder Advocacy, where we use the power of active ownership to engage with the companies our clients own in their portfolios to change corporate behavior. You can learn more about Gabe and his work here. 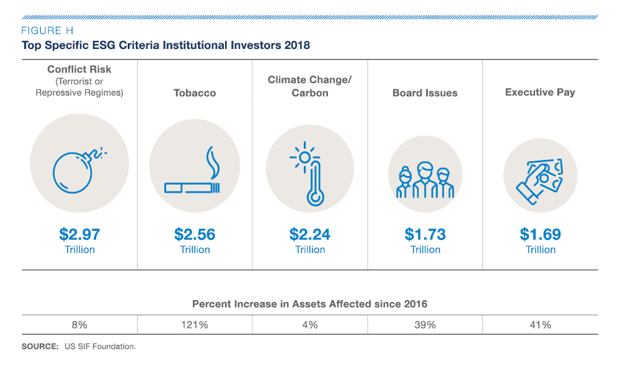 Our trade organization, USSIF, the US Social Investment Forum, puts out a biannual trends report, which examines the state of the Responsible Investing movement. 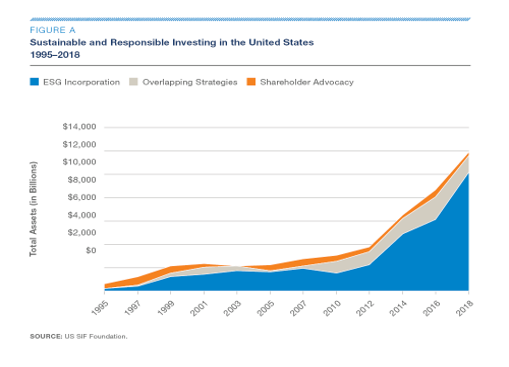 At the time of publication, almost $12 Trillion dollars is invested in responsible investing strategies in the US, which represents an 18-fold increase since 1995, and 38% growth since 2016, the last time this report was published. In fact, 26% of all assets under professional management in the US are now incorporating Environmental, Social and Governance data into their investment process in one way or another. This chart looks at Money Manager activity, which matters a great deal to us, as this is the category we fall into. In fact, as a firm, we contributed to this report through our continued membership in the United Nations Principles for Responsible Investment (you can view our data here), which was one of the primary sources for this report. 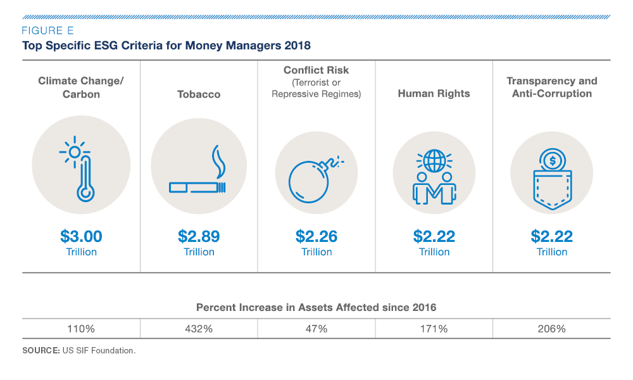 Clearly, both groups take similar sets of issues seriously, but institutional investors place a greater priority on Governance issues than money managers. In our view, institutional investors are well suited to working on governance issues, as they tend to be long term issues that require longer term engagement. Breaking this work down into more detail also yields insights: battles over Proxy Access have slowed down after strong investor support. The share of S&P 500 companies with proxy access policies grew from 1% to 65% from 2013 to 2017, so activity on this front has slowed as a result of having fewer targets to engage. This is a win! In many ways, while what has been accomplished is important, why investors are pushing for change is more interesting. 82% of managers report client demand as a factor, while three quarters cite risk and return separately. This means that your voice as a client can make a difference! By joining with the larger community of actively engaged investors, you can become a part of a community that is creating grassroots change within the financial services industry at large. When it comes to Risk and Return, we agree that long term investors should be considering Environmental, Social and Governance data in their process, as our investing thesis is based on the premise that using this data can expose risks to the long term prospects of companies we own in our portfolios. All investing involves risk, and our job is to manage that risk. We believe that ESG can be one more tool in the risk manager’s toolkit to help understand and manage risk, and we’re glad to see that this opinion is shared more broadly. The data still has some problems, however. 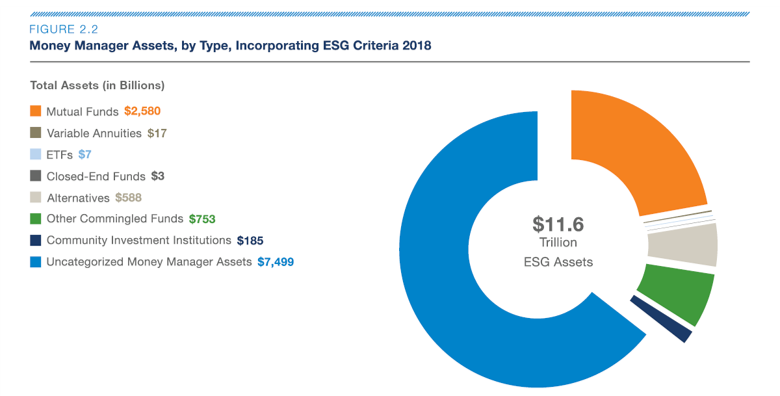 Looking at the types of assets that are incorporating ESG, by far the largest segment is “uncategorized money manager assets”, which is a term that’s exactly as vague as it sounds. While Mutual Funds, ETFs, Closed End Funds, Alternatives, and Community Investment Institutions all issue a Prospectus which discloses how they use this data (and we spend a LOT of time reading these documents to verify that our partners have policies in place that our clients want to see), the Uncategorized segment is largely self-reported, through a box on the Principles for Responsible Investing reports that says the managers are looking at the data, but not how they use it. You can view our PRI Transparency report here. We welcome your feedback! 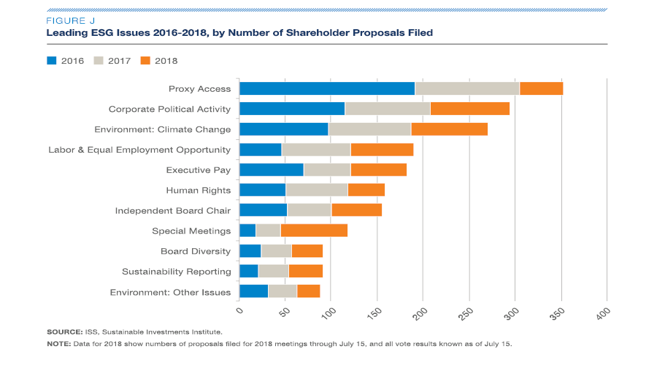 Higher support for Environmental and Social proposals: The proportion of shareholder proposals on social and environmental proposals that receive high levels of support has been trending upward. Equal pay: Several companies have agreed to report on—and correct—gender pay differentials in response to shareholder resolutions. Engagement: Behind the scenes, engagement is increasing: 88 money managers, with $9.1 trillion in AUM, reported that they engage in dialogue with companies, up from 61 money managers, with $6.1 trillion in AUM, in 2016. ESG Investing Basics: What are we trying do to? We talk a lot about ESG: Environmental, Social and Governance. Our investment thesis is based on the idea that this “extra-financial” data (meaning this is information that doesn’t necessarily show up on a company’s balance sheet or profit and loss statement) can have a material impact on the long term health and performance of a company. A great way to think about why we believe this is to look at this chart, which shows how the value of the companies in the S&P 500 index have changed over time, from the 70’s, when the vast majority of a company’s value was tangible, based on things, which can be measured. Over the past 4 decades, this has flipped, to the point where the vast majority of a company’s value is now based on intangible assets: things like good will, brand strength, and customer loyalty. As investors concerned with managing risk, we need data tools that look beyond the single bottom line of profits and financial data to understand how a company manages its’ Triple Bottom Line: People, the Planet and Profit. Taken together, these factors give us a more holistic look at companies, which helps us make better decisions. For example: a 2012 study by the Center for American Progress found that the cost to replace an employee is between 16% and 21% of that employee’s salary, and that quit rates are often due to workplace policies. Defining your screens & building a diversified portfolio that excludes the ‘right’ companies for you – how deep do you want to go? 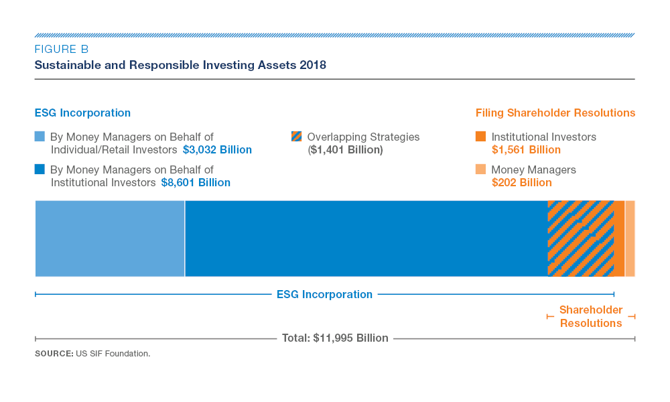 Where is the ESG data coming from? How is it being used in the process? How will different ESG methodologies result in different portfolios? Tend to be specific, narrowly focused investments. Only appropriate for a percentage of an overall portfolio Report on progress & outcomes. How do we know our investments are doing what they say they are? Avoiding investments in Fossil Fuels, Addictive products, or the manufacture of Weapons of War Index funds that track ESG indices, active funds that exclude low ESG scored companies from their “investable universe” Investments in Water, Gender Diversity, Clean Energy, or Low Carbon Specific bonds such as Green Bonds, Community Investment Bonds, investments in private companies that have a social or environmental mission. We offer investment portfolios or individual investments tailored to each approach. Get in touch to learn more! https://www.commoninterestsfinancial.com/wp-content/uploads/2019/02/ESG-e1549312455771.jpg 451 1056 Max Mintz https://www.commoninterestsfinancial.com/wp-content/uploads/2013/04/Transparent-Logo1.png Max Mintz2019-02-05 21:52:502019-02-05 21:52:52ESG Investing Basics: What are we trying do to? We talk a lot about the impact of our investments, but it can be difficult to see impact from a financial statement. That’s why our Broker/Dealer, Vanderbilt Financial Group, produced this video to show the impact our investments can have. We’re proud to share with you a video we were recently featured in: Good Returns, a story about Responsible Investing. If you’ve never encountered our way of investing, this is a great, quick introduction.